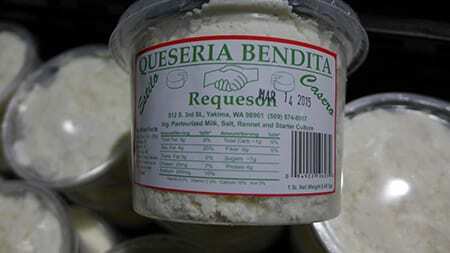 In Yakima, Washington State, the Queseria Bendita company has been compelled to recall numerous products that include Panela, Queso Fresco, Requeson, and Cotija fresh soft cheese as well as sour cream (creama agria) because of three reports of Listeria monocytogenes poisoning, causing Listeriosis. The Cotija fresh soft cheese and the sour cream (creama agria) have no best-use-by dates on them, but the Panela, Queso Fresco, Requeson, and Cotija fresh soft cheese products all have dates that extend to April 16, 2015. According to the US Food and Drug Administration (FDA) these products were sold at grocery stores in Washington and Oregon states as well as the company store in Yakima, and have been linked to at least one death so far. “These Mexican-style cheeses are all too commonly linked to Listeria outbreaks,” says Queso Listeria lawyer Ron Simon, a food safety lawyer who has represented thousands of victims of food poisoning. “At Ron Simon & Associates, this is the second outbreak of Listeria we are working on in the last year alone that has been linked Mexican style Queso products. Mexican style soft cheeses (Quesos) are sometimes made without proper pasteurization of all ingredients or without the safeguards necessary to keep the daily products free of Listeria.” If you or a loved one gets sick after eating Queso or one of the other Queseria Bendita products, seek medical attention immediately, as Listeriosis can be very dangerous. Then, call the lawyers at Ron Simon & Associates to speak to an experienced Listeria lawyer.